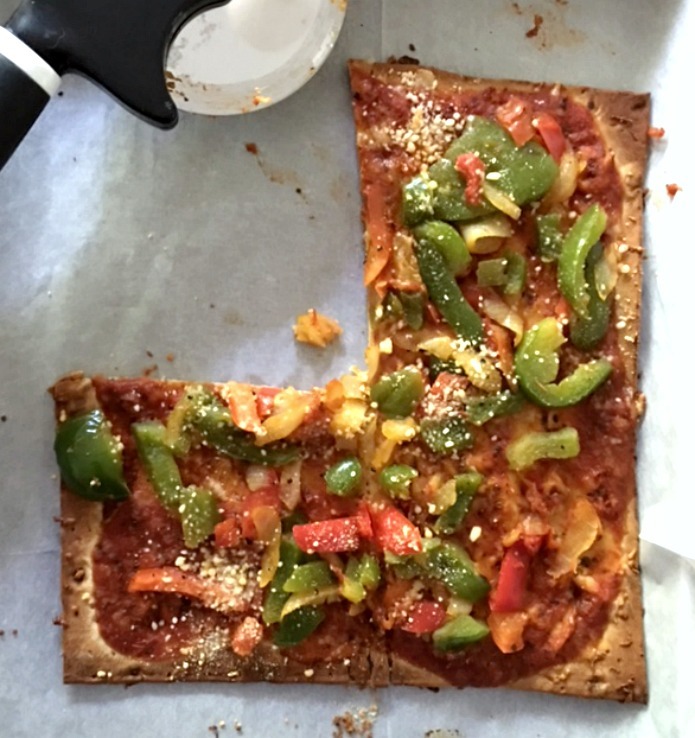 Flatbread Pizza with Roasted Veggies is so simple to make and tastes just like you get at your favorite Italian restaurant. I make this at least once or twice a week for lunch. It’s that good! Recently when out with friends for lunch, we ordered this really delicious flatbread with roasted veggies and chicken. It was so delicious yet pricey. I decided I had to make something similar at home. That’s exactly what I did the next day for lunch. I really liked this one even more! I made it just the way I like the crust, nice and crispy and this time I didn’t add any chicken. The veggies and cheese were just enough. See my shortcuts and make one today. 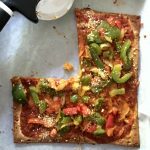 You will love this yummy pizza! 1 cup from a frozen bag roasted onions and mixed peppers, I love the Trader Joe’s brand, but any market has their own brand. 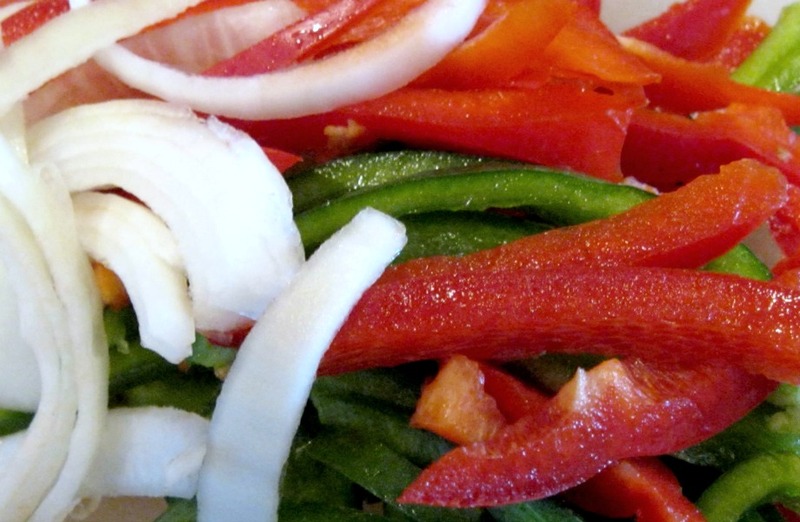 In a medium nonstick pan, Sauté veggies in oil or cooking spray until warmed. Lay foil on a cookie sheet, place flatbread only in oven for about 2-3 minutes. Just until you see it’s crisping up just a little. Take out and layer all ingredients starting with the sauce and ending with the cheese. Bake for another 5-7 minutes or until you see sauce bubbling a little and cheese is melted to the way you like it. 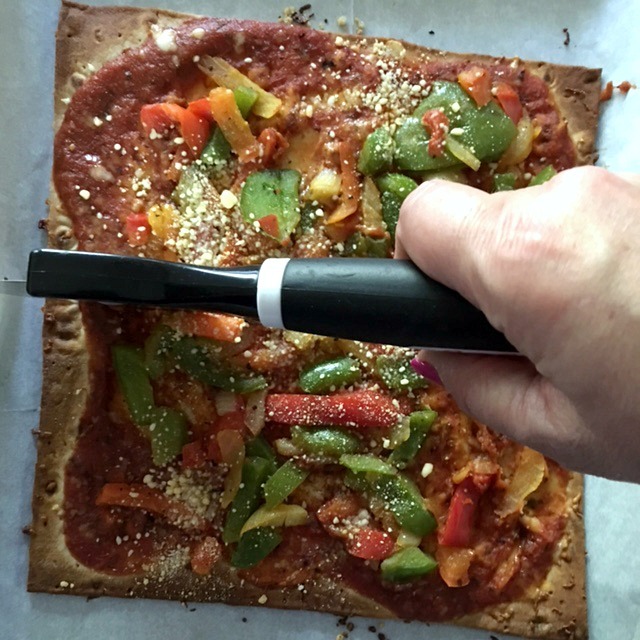 Take out of oven, drizzle oil over pizza. 1.Preheat oven to package instructions. 2.In a medium nonstick pan, Sauté veggies in oil or cooking spray until warmed. 3.Lay foil on a cookie sheet, place flatbread only in oven for about 2-3 minutes. Just until you see it’s crisping up just a little. 4.Take out and layer all ingredients starting with the sauce and ending with the cheese. 5.Bake for another 5-7 minutes or until you see sauce bubbling a little and cheese is melted to the way you like it. 6.Take out of oven, drizzle oil over pizza. Note: calories are approximate depending on what ingredients and products you use.